Dear Friends, Already a month has passed since our General Assembly and 10th Anniversary in Bangkok. I hope that we can build on the legacy that Ruben left us in his role as convenor and also the team before him, particularly Rungrote whom you met in Bangkok and “Jim” Rungtip Imrunguang who was a key member of our first CCI or CLC team as it was then. It is really a pity that she was unable to join us as she was in Laos for another conference during our event. Now I guess we are all trying to see best how we can work to implement the plans that we made in Bangkok. One of the things that we decided was to launch a newsletter and so I have compiled this bulletin to share with you some of what has been happening. Even before he returned to Zambia, Clement Katongo was making plans to launch an event in Africa, i.e. Zambia to mark the 50th anniversary of Vatican II. If everything goes to plan, this would be held in late 2012. We look forward to hearing of more plans. From Sri Lanka, Fr Reid has already held a meeting on 13 August to launch a Sri Lankan chapter of CCI with about 8 people present and plans for regular monthly meetings. From Australia, Kevin has been in contact with Cardinal Tom Williams, retired archbishop of Wellington, New Zealand, who gave a speech to 300 former YCW and YCS members from NZ at a 1996 event. Hopefully, we will soon be in contact with some of those people. From India, we have heard that the National Team met last week. Paul and Rebecca Sinappan are in fact on their way to India today for a personal visit and will meet with Ruben and other CCI leaders there. From the Philippines, Juanito has informed us of plans to establish a Treasurer’s Team to manage the finances. The Manila CCI group has also fixed a meeting for 11 September. So already lots of things are starting to happen! 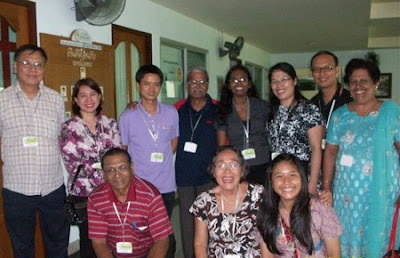 Meanwhile, I have been working here in Kuala Lumpur, mostly on developing the CCI websites. www.cardijn.info: This is our news website, publishing news item relating not only to CCI but to all the Cardijn movements and dealing also with lay apostolate, worker issues, etc. I have updated much of the background information and started to reorganise the site to fit in better with our needs. www.cardijncommunity.org: This website focuses on our own CCI organisation, activities etc. I have already posted up an initial online draft report of our General Assembly. There is still material to be added – and above all photos – please let me know if you have photos that we can add. Also, please let me know of any other suggestions that you have for content. www.vatican2plus50.com: This also is a brand new website on which I have started as a resource centre for our 50th anniversary of Vatican II project. As you can see, there are already quite a number of resources available there. Please send in suggestions for more development. www.newpentecost.com: This is our existing website for our annual New Pentecost activities which have been held each year since 2005 in various countries – sometimes big, sometimes small. This was a follow up to our original Vatican 2 + 40 program in 2002 to mark the 40th anniversary of Vatican II. www.josephcardijn.com: This is our website for publishing documents by and concerning the life of Joseph Cardijn. www.josephcardijn.fr hosts the Cardijn documents in the original French. https://sites.google.com/a/cardijn.info/cardijn-resources/: This is the Cardijn Resources website for other Cardijn related resources. This will be revamped shortly, I hope. As you will also see the websites are all linked to each other thru the top menu bar on each site. Already the sites are attracting over 1000 visits per month and hopefully this will grow as people discover the range of resources that are available. This is a really great encouragement and I hope we can keep going. It is also interesting to note that the next World Youth Day will be held in Rio de Janeiro, Brazil, in 2013 – only two years away. Some of you will know that Cardijn had a tremendous influence in Brazil through the YCW, YCS, University YCS, and other Catholic Action movements. Wouldn’t it be great if we could find a way to make sure that Cardijn is on the agenda for World Youth Day Brazil? Anyway, there’s lots of work to do! But let’s start simply!